Could this gentle painting teacher have posthumously inspired a generation of gamers to try art? Every 80s baby remembers Bob Ross, the gentle-voiced art instructor whose public television show brought "happy trees" and "almighty mountains" to life before your eyes, often using nothing more than a pallet knife, a fan brush and a little Titanium White. Although Ross's "Joy of Painting" ceased airing in 1994—right before he passed away from lymphoma in 1995—he's being remembered and adored today by a potentially unlikely crew: gamers on streaming service Twitch.tv. Twitch's audience primarily convenes to watch people play video games live, alternately cheering players on and trolling them with a fascinatingly-specific vocabulary of in-jokes, memes and visual iconography. Sometimes this leads to expansive and delightful cultural phenomena—remember last year's 1.16 million-person Pokemon game, and the rich bank of lore that organically sprouted up around it? Have you heard about the communal machine art of Salty Bet? In Twitch's latest happy surprise, the world of meme-spouting esports geeks has been drawn into a charming relationship with late painter Ross. The service just launched a "Creative" channel, and celebrated it with a nonstop marathon of all 408 "Joy of Painting" episodes starring the gentle painter and his teaching techniques. The results have been genuinely beautiful: The Twitchers are transfixed by Ross, his warm throwback style and the way he summons lakes and fir trees to the canvas as if anybody, even you, could do it. Though the popular "Let's Play" format often involves lots of yelling—streamers chatting and shrieking while irritable meme jockeys accuse them of cheating— watching Bob "play" gently with color, light and idiosyncratic vocabulary ("don't piddle it too much", he softly warns aspiring painters to the chat's sincere delight) has had a charming effect. I clearly remember being little, watching Bob scrape misty mountainscapes gently across a pale sky. Suddenly he'd slash the canvas with a knife of Van Dyke Brown, and though he promised it was a tree trunk—and it always would be, quite beautifully in the end—the child-me would be secretly horrified, convinced he had ruined it. RUINED, the Twitch chat erupts with hundreds of users every single time Bob begins a new landscape feature, a slash of brown or black whose role in the pastoral environment has not yet been clearly established. I can't help laughing along. I want to type RUINED, too. "trust in bob," users urge in response. "have you learned NOTHING," laments another. Whenever Bob finishes a painting, everyone types "GG", or "good game", a common post-competition sign-off. Relatively-obscure internal video game language becomes wonderful in its new context; chatters praise his "god-tier" skills, or suggest he has "nerfed" an ugly feature by blending it more naturally with the rest of the painting. With "The Joy of Painting", which aired on PBS from 1983 to 1994, Ross sought to democratize the arcane and elite art world with clear, unpretentious instruction (his biggest tip is to make sure you have enough paint on your brush) and a gentle, playful attitude. "This is your mountain," he might say, hoping to offer the at-home viewing audience an opportunity to feel as if they had the right to make art—and to enjoy it just as much as some fancy-pants painter. Ross sought to challenge the misconception that art had to be gatekept by skill, and that spontaneity and imagination mattered the most. "Let's have a river," Ross might decide. 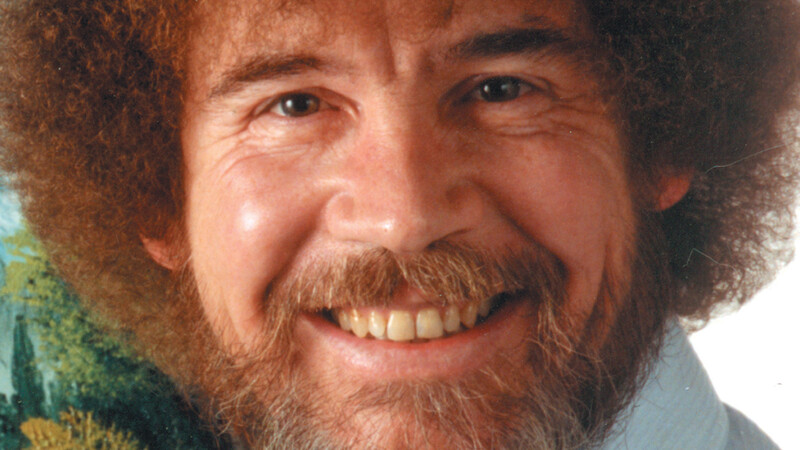 "There are no mistakes, just happy accidents," he advises. "Let's give this tree a friend," he suggests. "I wish I had a friend," reply several tens of Twitch users, either in ironic unison or sincerely. This democratic approach, his hypnotic soft voice and the deeply-soothing, ASMR-inducing patter of brush on canvas make Ross a secretly-awaited hard counter to the traditional world of public "gaming" and Let's Plays. Where games culture traditionally prizes "elite" skills and internal knowledge, Ross offers an environment where participants get to watch something rare and magical coalesce—and yet the skills still feel attainable, and the simple spectator always feels welcome and loved. Lots of the people typing "can Bob respond to chat?" are trolling; some of them might just be young and genuinely hopeful. You can't know, really. It's rare that we get a chance to remember that sometimes the crowds really are wise. It is easy to develop and to calcify a natural suspicion of "gaming community" online. Which makes experiences like the Bob Ross Twitch collective all the more meaningful—what if the gentle painter posthumously inspired tens of thousands of chat-spamming esports geeks to try making art? What if the parlance of Bob Ross' old democratic, joyful painting program made its way into the cultural vocabulary of competitive video games? It's almost enough to restore your faith in humanity. If you like to watch people play arcane games while talking softly and serving ASMR keyboard tapping, you might enjoy my Lo-Fi Let's Play YouTube channel, explicating odd 1980s and 90s adventure games.